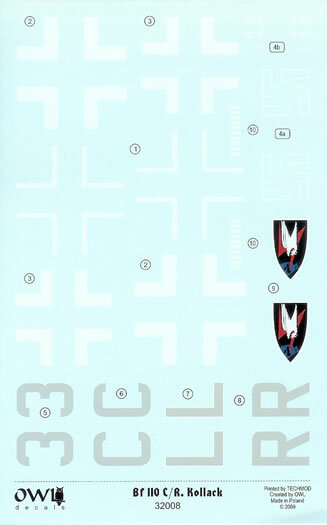 Water-slide decals, with placement and colour scheme guides. 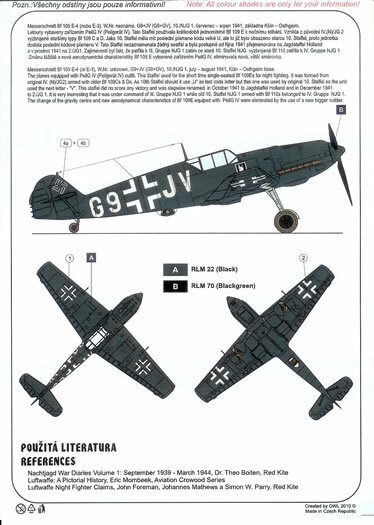 None readily apparent but see comment regarding Bf 109E with PeilG IV). Should appeal to Luftwaffe & Regia Aeronautica night-fighter fans. 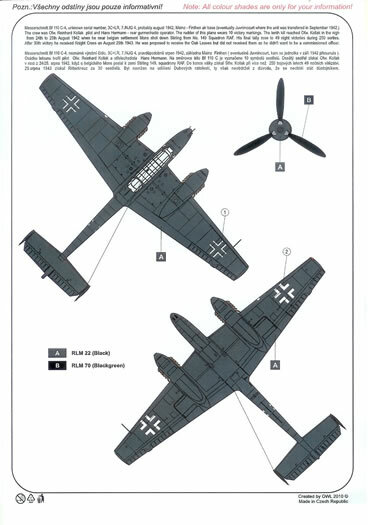 As the RAF switched to a night bombing offensive the Luftwaffe had to develop a night-fighting arm. The aircraft used were initially essentially day fighters often with minimal adaptation to night flying and no airborne radar. Likewise, the Italians also had to respond, although to a much lesser degree. 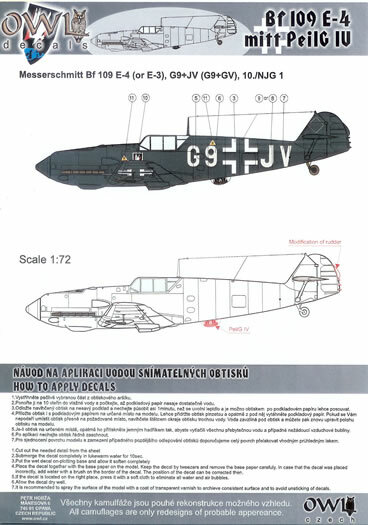 Owl Decals is probably best known to modellers for their range of decals and detail accessories, with a particular emphasis on Luftwaffe night fighter subjects. 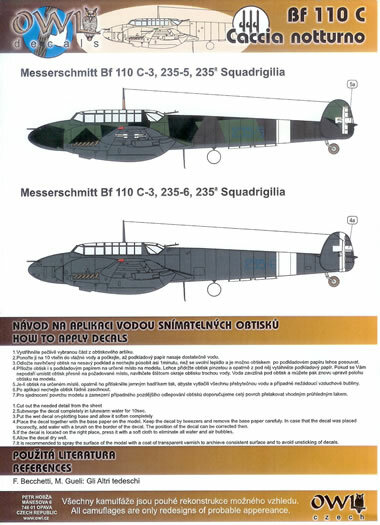 The decal sets reviewed here in keeping with this emphasis and are applicable to early Messerschmitt night fighters used by the Luftwaffe and Regia Aeronautica. 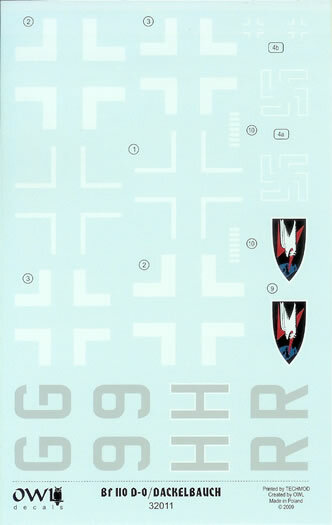 The decals come in zip-lock plastic bags with clearly printed placement and colour scheme guides. 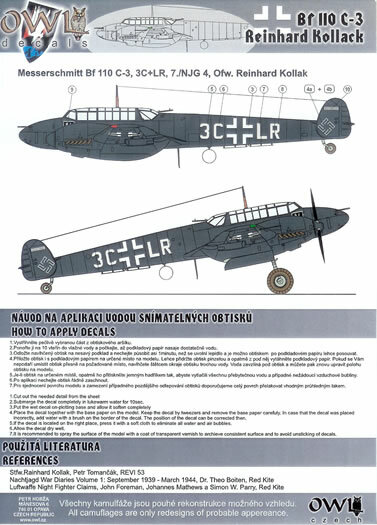 Instructions are in English and Czech, and colour call-outs use RLM codes. The production quality appears to be excellent, and following images should give the reader a good indication of what’s included with each decal pack. 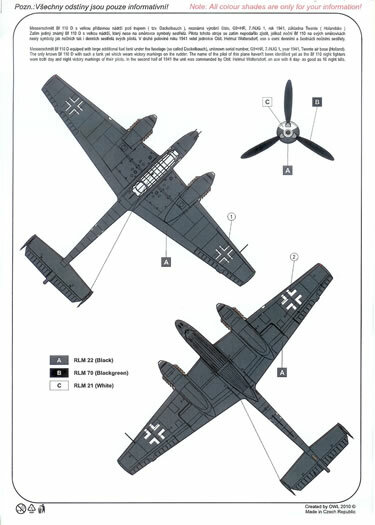 The Bf 109 decals are for an aircraft equipped with PeilG IV direction finding equipment on the ventral surface of the fuselage behind the wing. 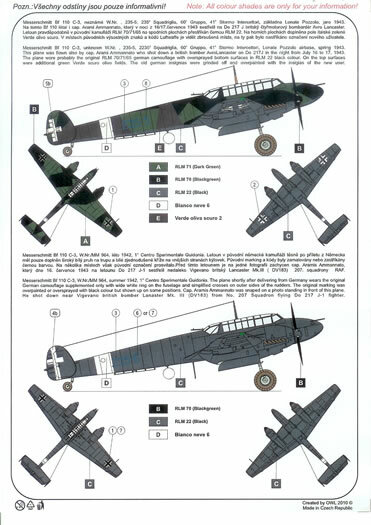 This will need to be scratch-built, although one of the on-line suppliers listed above is taking pre-orders for decals and a conversion set by Owl. This is for the same decals reviewed here plus the PeilG IV components - presumably in resin with a clear vac-form teardrop cover. 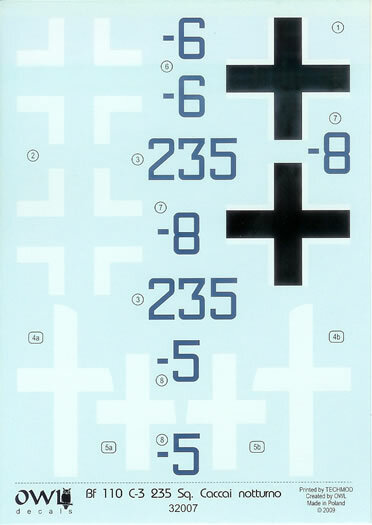 Although not reviewed here, Owl Decals offer some of these same decal sets in 1/72 and 1/48 scales as well. 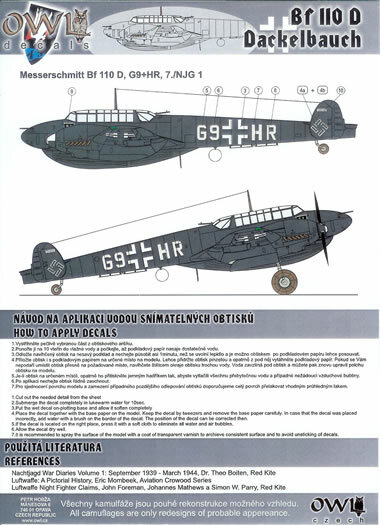 These appear to be very well produced decal sets to finish early model Bf 109’s and Bf 110 in night-fighter garb: Recommended. Thanks to Owl Decals for the review samples.